Somewhere in a parallel universe, Mary Hopkin presides as an insightful grande dame of British popular music, afforded her due as a fine singer and an astute, thoughtful songwriter. In reality, of course, she has long-since eschewed such a high-profile path, preferring to maintain a low-key presence in the industry, taking a gently cynical stand against some of its more outrageous manifestations, and popping her head above the parapet on Twitter from time to time. Thankfully, however, there is still new music coming from the Hopkin household, and that lovely, expressive voice – with the extra shades and textures of maturity – continues to captivate. Following on the heels of You Look Familiar (her 2010 collaboration with son Morgan Visconti) and the contemplative Spirit, her latest album – Painting by Numbers – is an intimate set of mainly home-made recordings featuring just Hopkin and her guitar, with occasional guest musicians adding some harmonic depth at the mixing stage. As she explains in her sleeve notes, most of them have been lifted from DAT copies and even a worn cassette (the gorgeous “Incurable Romantic”), the master tapes having vanished long since. Polishing is kept to a minimum. A handful have been mixed and engineered in the studio, a few harmonies added here and there, but always without sacrificing the sense of a spontaneous take, complete with its slight hisses and clicks. 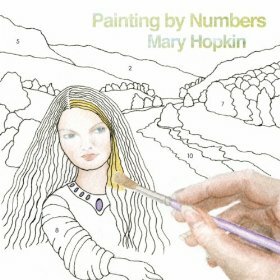 Painting by Numbers emerges as a sweet, thoughtful, honest work of integrity, showcasing Hopkin’s distinctive, effortlessly wistful voice and making it seem impossible that more than 40 years have passed since “Those Were the Days” made her a household name. The essential melancholy of that signature song, with its undertow of life-lessons learned the hard way, found the perfect vehicle in Hopkin’s timbre, and it unravels further through these ten numbers, from the title track, through the touching reassurance of “Fair-weather Friends” (mixed by Alan Britton, who has also added some rich, steely guitars, and featuring Hopkin’s own backing vocals mixed by Visconti), to the poignant “Love, Long Distance”. Part timeless folk melody, part meditation on love’s ability to survive the passing of time, the Visconti-mixed “Gold and Silver” is the standout track on the album, a delicate and hypnotic threnody that hangs tantalisingly in the air before it dies away. There are other delights. “Improvisation” is a wordless chant which works its way under your skin, “Fresh out of Favours” a world-weary emotional stock-take, “Die for you” a reminder of the power of constancy, and “Teardrops” a cautionary look in the mirror. Rounding things off, “Love Belongs Right Here” perfectly captures the lump-in-the-throat moment of parting, and is one of several moments when the album’s bittersweet quality gives your heartstrings an unexpected tug. Studio interventions aside, you are left with the overriding sense of a singer at peace with her art and content to let it speak for her, plainly and simply. It’s Eurovision season again, which is a tenuous hook for introducing an article about “Those Were the Days” – an evergreen hit for Mary Hopkin who, of course, represented the United Kingdom in 1970. Alas, it wasn’t with this number, an old Russian folk song. If it had been, she might have sent Ireland’s Dana packing. Instead, she came second with the rather dismal “Knock Knock, Who’s There?” She’s never made any secret of her dislike of this typical old-school Eurovision ditty. The following article was from a long-running series called Songscape, which I contributed to the now-defunct Singer magazine for several years. I’ll be posting a selection here during the next few weeks. I note that I referred to Mary’s spasmodic returns to recording. Happily, in the interim, she has been back in the studio – and the album (You Look Familiar) she made with her son, Morgan Visconti, a couple of years ago proved that her golden voice is still in fine fettle. If you like your nostalgia tinged with a dose of world-weariness, “Those Were the Days” is guaranteed to send you into a reverie populated by your own loved and lost, tempered with a dark veneer of experience. It’s a folk survival anthem in a minor key, occasionally betraying its somewhat lugubrious, fatalistic Russian roots before rallying itself for that instantly recognisable, bittersweet refrain that harks back to more carefree times. The melody of “Those Were the Days” is possibly an ancient Russian folk tune, although some sources claim it was written by a pair of Russian songwriters towards the end of the 19th century. Its early history is traced on Pat Richmond’s fascinating Mary Hopkin website, which includes an audio link to a native interpretation by Rada and Nikolay Volshanivovs. But the song was probably first heard more widely when it was sung by Maria Schell in the 1958 film adaptation of The Brothers Karamazov. Around the same time, the great American folk composer and songwriter, Gene Raskin, encountered it and produced the English lyrics we know today. Raskin and his wife, Francesca, kept it in their repertoire and when they appeared at the Blue Lamp club in London in the mid-1960s, Paul McCartney heard it and stored it in his memory bank. A couple of years later, he retrieved it and suggested it as the debut single for his protegée, the Opportunity Knocks winner and new Apple signing, Mary Hopkin. Armed with a voice as pure and true as anything that has graced the charts in the decades since, and a plangent arrangement that featured various strings – including a Hungarian version of the dulcimer – and a boys’ choir, Hopkin scored a huge international hit and secured her own place in pop history. On paper, it shouldn’t have worked. Hopkin, a vision of youthful innocence with her unspoilt folk-singer’s soprano, was hardly a convincing prospect for lyrics imbued with the hard-learned lessons of life and the wages of experience. But somehow, she got to the truth at the heart of the words and made them her own. The recording, as evocative today as ever, never leaves you doubting that the lonely woman she sees in her reflection is really herself. Both Hopkin and Sandie Shaw recorded “Those Were the Days” in a number of different languages for the international market, singing phonetically in the custom of the time. Shaw’s Italian, French, German and Spanish efforts have recently resurfaced, nicely packaged, on a series of compilation CDs. Unfortunately, they trade the subtleties of the Hopkin arrangement for the brassy oom-pahs that tended to characterise so many of her records. Despite her valiant efforts, she always seems to come second to the band. When Hopkin recorded the song, perhaps she was already anticipating how quickly life in the mainstream recording industry would stale. To the regret of her contemporary fans, and plenty who have discovered her since, Hopkin turned her back on a commercial career after a couple of albums. She has made only spasmodic returns to public performance, always on her own musical terms. How touching it is, then, to hear a familiar voice among the harmonies for the title track on Dolly Parton’s album, Those Were the Days. Parton, an immensely likeable, serious musician, almost claims the song for her own. But she had her people call Mary’s people, and Hopkin’s tones – remarkably undiminished by the years – shimmer through the proceedings in delightful memory of times past. The 1968 worldwide hit is still fresh and arresting after all these years. A concert version is also available on Live at the Royal Festival Hall 1972, released on CD by Mary Hopkin Music. One of the highlights of a jewel-studded album from an artist who, beneath the wigs and the front, just keeps on getting better. Hopkin guests on the harmonies. Interesting collection of Shaw’s French language recordings, including “Le Temps des Fleurs” (“Those Were the Days”). She races the band all the way to the finishing line. It’s hard to believe that more than 40 years have passed since a Welsh teenager with a melancholy, angelically crystalline voice and a curtain of blonde hair won a British TV talent show – Opportunity Knocks (how quaint that now seems compared with the global machine that is X Factor today) – and secured a substantial chart career that lasted into the early 1970s. The name Mary Hopkin will be forever associated with the Paul McCartney-produced “Those Were the Days”, a fatalistic traditional folk song, probably originally from somewhere east of the Urals, which gave her a number one hit. Hopkin was an important early signing for the Beatles’ iconic Apple label. She went on to work with Mickie Most on a number of hits and represented the United Kingdom in the 1970 Eurovision Song Contest. But while she came second with “Knock Knock, Who’s There?”, the experience of singing a song that she has never made a secret of loathing only added to her growing distaste for the manipulation of the music industry – and a lack of influence over her own career that was the lot of most young female singers at the time. Although she continued recording intermittently through the 1970s and 1980s, much of Hopkin’s subsequent work was within the collaborative security of project bands Sundance and, later, with Peter Skellern and Julian Lloyd Webber, Oasis (long before a pair of Mancunian brothers changed the trajectory of British rock with a group of the same name). Hopkin seemed bent on putting as much water between her and the days of her greatest commercial success as possible. And although there have been occasional snippets of new work in the intervening years, interviews became rare and accordingly, she acquired a reclusive, increasingly enigmatic reputation – not unlike that of Kate Bush. 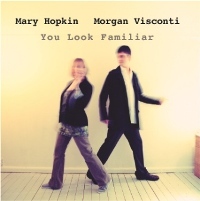 Now, she has released a fascinating new album (You Look Familiar) written and produced in partnership with her son Morgan Visconti – and it’s a treat from start to finish, not least because those pristine vocals are utterly undiminished by the years. But it is also a work of real, thought-provoking depth that references Hopkin’s folk roots (“Chime” is the most overtly folk-accented track) and influences as she relates a sequence of rounded, modern stories, from the opening track (“America”) with its tale of the young stowaway heading East to the uneasy warnings of “Eve’s Revenge” and the easy, resigned chug of “Dog Eat Dog” – a catchy pub song. Intriguingly, many of the arrangements are cradled in infectious, synth-style riffs, beats and echoing overlaid harmonies (some courtesy of daughter Jessica Lee Morgan, a singer in her own right) that often create a retro sense of lush 1980s electronic pop. But don’t be seduced simply by the sound. Piercing barbs lurk in the lyrics, reminders that Hopkin now has the lifetime of experience that she was only able to hint at as the 18-year old singer of “Those Were the Days”. There is darkness and stinging cynicism, too. I don’t know who she had in mind, writing “Heaven Knows”. But even if her target was personal, the stinging words could equally apply to higher, more public figures and I can think of one or two politicians who would be usefully caught in their firing line. I love “People Say”, a wise and touching account of an unexpected encounter that could lead to something more, the motherly advice of “Walk Like Me” and the epic, hypnotic forebodings of “Pretenders”. With You Look Familiar, Hopkin has emphatically shaken off the shreds of nostalgia and reminded us of a voice and pedigree that have much to offer in 2011. Don’t leave it so long next time, Mary. We’d like some more – and soon.